Banana bread is often underrated and overlooked. I can hear you now. Ho-hum, you are saying. Banana bread is just so yesterday. Yes, everyone has a banana bread recipe, but this is the one we use in my family. It is the banana bread my mom made for my brothers, my sister and me, and for all her grandchildren. Now that I am a grandmother, this is the banana bread I make for my precious granddaughter. This is the banana bread that is at the top of the favorite foods list for three generations of our family, so it is definitely not a ho-hum recipe for us. 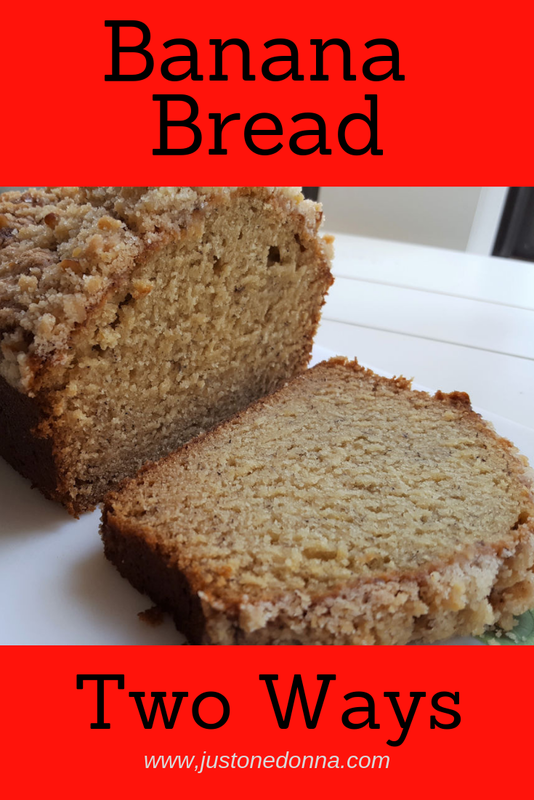 If you haven't made banana bread in a while it is time to make it again. 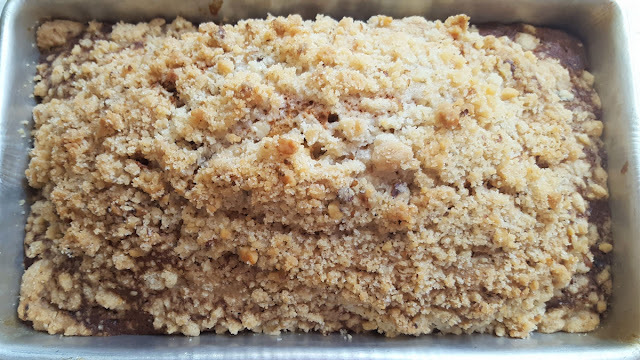 Our family favorite recipe can be baked either plain or with a sweet, crunchy topping. This is my favorite banana bread made two ways. 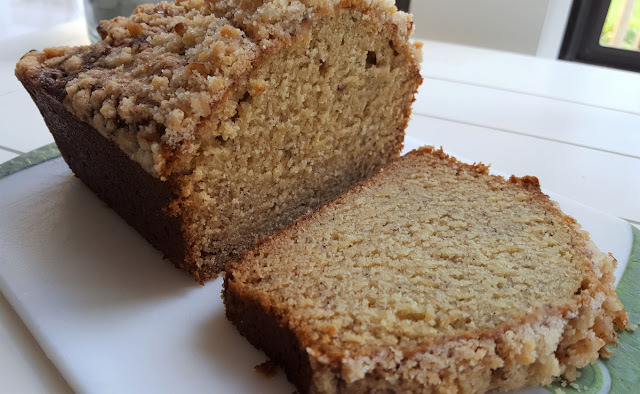 Banana bread is delicious any time of day. It is perfect in the morning with your coffee. When you need a grab-and-go breakfast, a slice of banana bread is a good solution. I think a slice of banana bread is easier to eat on the run than a muffin. In my experience, picky little ones will often eat banana bread when nothing else interests them. Don't forget banana bread as a sweet snack option. I love a slice of banana bread with a steaming mug of my favorite tea mid-afternoon. Banana bread freezes beautifully. Just wrap it tightly in plastic wrap and place it in a freezer bag. There's nothing better than having a loaf of banana bread on hand for when you need it. Tip: Freeze ripe bananas by first removing the peel and then wrapping individually in plastic wrap. Store in a zipper freezer bag to use when making banana bread and smoothies. The traditional way to make my banana bread is to follow the recipe without making the crunch topping. That's how I make it most frequently. 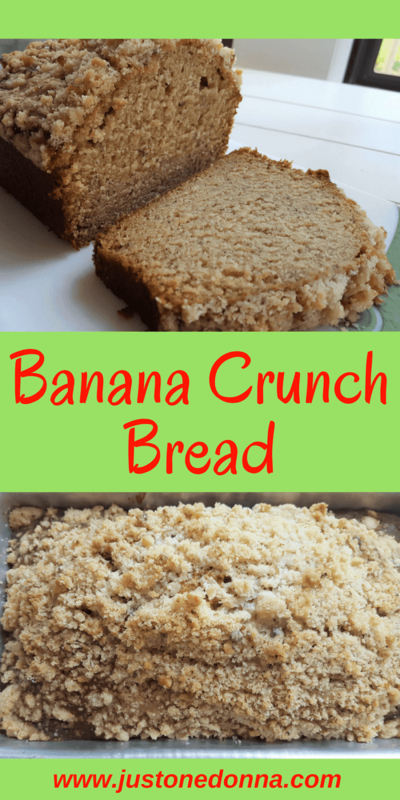 When you are in the mood for banana bread with a twist, just add the crunchy topping. Who doesn't like a little bit of sweet crunch to start their day? Optional: Make the crunch topping. Place the flour, sugar, and butter in a medium bowl. Using your hands, toss the ingredients and then squeeze the butter, flour, and sugar together between your fingers until well combined and crumbly. Bake for 50 minutes to one hour or until a toothpick inserted in the center of the loaf comes out clean. Be careful not to over bake. Occasionally I liked to add a Kitchen Essentials section to my posts. I do this for two reasons. First, I don't believe you should clutter your kitchen with a bunch of silly, single-use tools but the tools you do have should be practical and provide good value. I want to share with you which tools fit that description for me. Second, including affiliate links to products I think you need, will like and most importantly, use helps to cover the costs of operating this blog. If you choose to make a purchase using one of those links I will earn a commission for referring you. The cost to you will be the same as if you didn't use my link. I think that works in both our favors. Win-win! Today's banana bread recipe is wonderful because it doesn't really need any complicated gadgets. This is a perfect recipe to focus on the basics in your kitchen. Below you'll find my affiliate links for a beautiful loaf pan made in the USA, a set of stainless measuring spoons that includes a 1/8 teaspoon measure, a set of stainless measuring cups for dry ingredients that includes a 3/4 cup measure, and my favorite set of three glass liquid measuring cups. Each of these is certainly a kitchen essential. Is it time for you to update your kitchen basics? Thank you for sharing this post with your friends on social media. Your Facebook, Twitter, Pinterest, and Yummly shares are greatly appreciated.